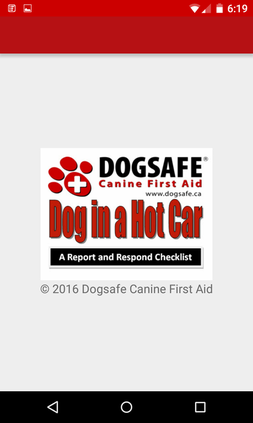 Dogsafe Canine First Aid has made it easy with our Dog in a Hot Car Responder mobile app. Dogsafe's Dog in a Hot Car Responder mobile app was created by Michelle Sevigny, founder of Dogsafe Canine First Aid, and previously a police officer and professional dog trainer. Real life experience, real life application. Why isn't this available for My iPhone? Thank you for your interest in our app. Our current app developer only creates apps for Android users. We'd really love to develop an iOS app for iPhone users and hope to do that in the future once we connect with an iOS developer within our budget. Thank you for asking that. Free apps contain ads as a method of generating income, which is needed to create, develop and launch an app. We absolutely did not want intrusive pop-up or flashing ads within our clean, clear screens in the app -- there is no place for distractions during a dynamic canine first aid assessment and possible emergency situation! As a result, we decided to go with a user-paid option and we hope that you'll agree that $2.99 is a low investment to potentially save dogs. Our Dogsafe Canine Heatstroke Awareness and Responder Network community program offers helpful tools and resources, of which 80% are available for free, including our Dog in a Hot Car Responder Checklist downloadable PDF, and the revenue from our low-cost also will help us create, develop and launch even more! About us and links to this website. If you don't agree with our License/Liability Agreement, please don't use this app. The Dogsafe Dog in a Hot Car mobile app was designed by Michelle Sevigny, creator of Dogsafe, and developed by Bastab Chakraborty. ® Dogsafe and Dogsafe red paw logo are registered trademarks of Dogsafe Canine First Aid.